Enjoy Utah! : Vote For Enjoy Utah! 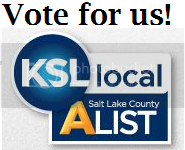 Vote for us in the KSL Salt Lake County A-list! KSL is compiling an A-list directory of local companies. Vote for Enjoy Utah! as best local blogger! Remember, every vote counts, so share this with your friends!